Now y’all know that I love me some blueberry… ANYTHING. I’ve planted blueberry bushes to keep myself in steady supply of those delicious & oh-so-nutritious orbs but until those plants grow large enough to satisfy me I’m stuck using purchased frozen berries. Recently I realized that I had two bags of blueberries in the freezer. So I decided to make blueberry jam with some of them. I searched around online & decided on this recipe I found at Food.com since it didn’t contain any added pectin. Of course as is the norm for me, I amended the recipe to suit our tastes. I’ve read that it’s not wise to double the recipe batch when making jams. Unfortunately I found out firsthand when I didn’t heed that warning. So I stuck with the quantity of berries shown in the recipe. First I measured out the ingredients: 6 cups of blueberries, 3 cups of sugar, 1/4 cup lemon juice squeezed from the lemon, a couple of teaspoons of finely grated lemon rind and a teaspoon of vanilla extract. I chose a large stockpot to cook my jam because as you know when a sugar mixture begins to bubble & boil it can splatter causing painful splatter burns. So my larger stockpot and a long wooden spatula were my tools of choice today. I also washed my canning jars and lids and placed the jars in my oven set to 220 degrees to keep them hot. Then I boiled some water, removed it from the heat & placed my rubber Tattler seals into the water to soften them. Lastly I placed a few metal spoons in the freezer to use to test my jam. 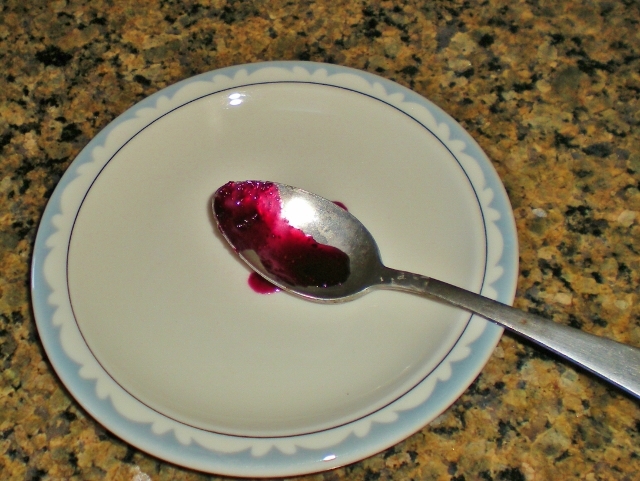 ( super-cold spoon will cool the hot jam quickly so you can test for sheeting.) Now I’m finally ready to begin making the jam! I read that the rind of a lemon contains lots of natural pectin. So after mixing all the ingredients in my stockpot I cut the leftover lemon rind into thick strips & tossed the strips into my stockpot with the other ingredients. (I’ll remove these strips before ladling the cooked jam into my jars) I brought the mixture to a rapid boil. After about 20 minutes I tested for sheeting on one of the spoons from my freezer. 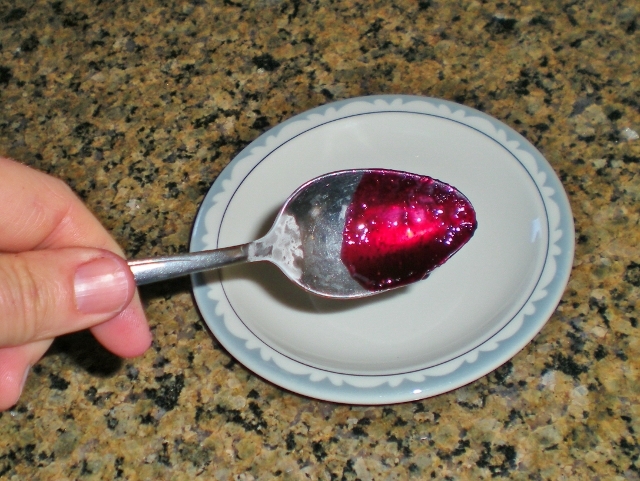 I scooped up some jam with one of the cold spoons and held the spoon at an angle to see if it coated the spoon or simply dripped off. Humm… still looks just a little too thin for me. It wasn’t quite ready yet. After about 5 more minutes of boiling my jam I noticed the mixture seemed to be getting thicker. Now when I stirred it I could temporarily see the bottom of the pot before the jam covered it again. So I decided it was time to test it again and it was about as thick as I wanted it to be. Notice how the jam sheets along the surface of the cold spoon? Since I’ll primarily be using my jam stirred into my daily homemade yogurt for breakfast I don’t want it to be too thick. Twenty-five minutes of boiling was about right for me. Now I ladled the hot jam into my clean & hot canning jars & wiped the rim to remove any drips that would keep the jar from properly sealing. And I attached my 2-part tattler lid/seal, tightening it finger-tight with a regular metal canning jar lid. I processed 3 of the 4 jars in a 5-minute hot-water bath to seal them. The remaining jar went into the fridge to be used right away. The jam turned out delicious and I loved how inexpensive it was & the fact that both the jelly jars & canning lids are reusable. I bought a supply of reusable canning lids and seals awhile back & I really have given them a workout – I’m pleased to report I’ve never had a failed seal with them. I had always hated the waste of throwing the canning lid away after a single use. 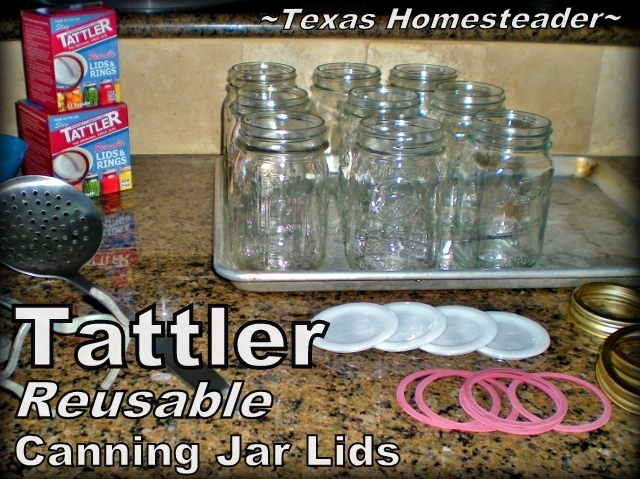 So I love that I don’t have to waste the lid each & every time I do some canning as these * Tattler Lids are reusable for quite some time. So this jam is a double win – good for me, good for the environment. Now I must note here that I’m sharing how I preserved my jam and it worked great. But different canners require different procedures. Even your area above sea level affect your specific procedure. For safe & specific directions be sure to consult your canner’s manual. And also be sure you read the USDA’s recommendations on safe canning and follow their directions closely – food safety is important! In large stainless steel or enamel pot, blend with a stick blender or crush with potato masher 3 cups of the blueberries. Add remaining berries, sugar, lemon juice and grated lemon rind. Bring to a boil over medium-high heat and boil for 20 to 25 minutes or until thick, stirring often. When the jam is as thick as you like, remove from heat, skim off any foam & stir in vanilla extract. 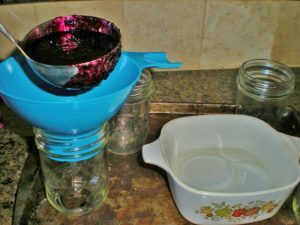 Ladle hot jam into hot jars to within 1/4" of top rim, wipe the rim clean & attach lids. To preserve jam use preferred safe preservation method. Wild Plum Jelly – No Added Pectin! * A word about our Affiliate Link – We are currently enrolled as an Amazon Affiliate. Occasionally I will insert an affiliate link into one of my posts if I think it may be of interest to you. Both of the items linked in this post really help me in my canning endeavors! I receive nothing from the manufacturer, but I love my Tattler lids & thought you might too. If you click on any of my affiliate links and buy something (almost anything, not just what was linked) I get a small referral percentage from Amazon. But here’s the really important part – the price you pay for your items is UNCHANGED. 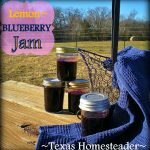 This entry was posted in Blog Posts and tagged Cooking, Environment, Food Preservation, Frugality, Gardening, Make-It-Yourself, Recipes on January 31, 2014 by Texas Homesteader. 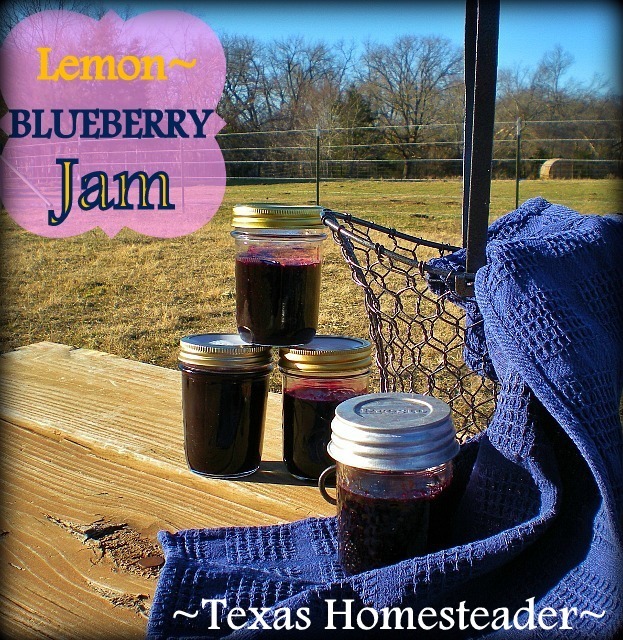 I really love Blueberries so this would be the perfect jam for my taste buds! This Jam looks so amazing! I didn’t know lemon rinds hat natural pectin…good to know! Thanks for sharing on My 2 Favorite Things on Thursday – Link Party! I hope to see you again tomorrow! Pinned! I love!! Thanks for sharing on My 2 Favorite Things on Thursday! Hope you come back and share some more!! Pinned! I love blueberries, we bought 40 pounds from our local farmer last year and made so many jams and pie fillings (along with freezing a bunch for smoothies). I would have loved this recipe back then! Thanks for sharing at the Art of Home-Making Mondays this week! Thank you for linking this to GTT! I’ve shared it all over because its genius! Our blueberries will be ready soon and I can’t wait to give this a try. I love the fact that is is lower in sugar and doesn’t need pectin. Thanks for sharing at Green Thumb Thursday. Even better is blueberry-lime jam. It’s a classic Ball recipe. We made it in my beginning canning class a couple of years ago. I was dubious….blueberries and LIME?….but it actually is pretty awesome. Lime juice and a bit of chopped lime rinds. Lemon skin does indeed contain a lot of pectin; it’s one of the sources of some commercial pectins (although most come from apples). However, blueberries have a lot of natural pectin on their own as well, so they often don’t need added pectin. Good stuff! Love the buckleberry jam idea. I’ll have to try it sometime. Yum! Thanks for sharing on The HomeAcre Hop! Hope to see you again today! I love the idea of adding the vanilla. I can’t wait to try it. Thank you for sharing on Green Thumb Thursday. It will definitely a good idea to exclude pectin from the jam. Homemade jam are so much fresher. Thanks for sharing with 4 seasons blog hop. cheers and have a nice day. This was great – would you, pretty please, link it up at Green Thumb Thursday? http://homesteadlady.com/green-thumb-thursday-43014/ Have I asked you this already – have you heard of Homestead Bloggers Network? You’d be a great fit! I love the sound of this jam. I never knew you could use lemons to make the jam. I love those lids too! I hate throwing the lid away too! I will have to check them out. Thanks for linking this great post to the In and Out of the Kitchen Link Party! Great info and this looks so yummy! Thanks for sharing at TTF! Sounds wonderful! I made Buckleberry Jam this past summer which takes blueberries, raspberries and strawberries. We never seem to get enough blueberries off our bushes to make just a blueberry jam. I always say maybe next year.